Over-all, I'm so glad I waited for this phone and didn't get the full size X10. Not that there's anything wrong with the X10, or other full-sized Android devices... but this has everything I needed in a small form factor.The X10 only failed me on one aspect, size. For work it's great... but a little too big to carry around all the time. Not fond of swapping phones anymore.. did that for a few years... got too bulky.Tried the iPhone... great PDA...horrible phone/SMS. Resorted to P1i and an iPod Touch. Worked really great til my P1i died. iPod Touch was primary PDA for a while.X10 Mini Pro is just what I wanted... an up to date smartphone that's small. Once they issue the 2.2 update with the Wifi hotspot feature, it'll be perfect. Anything this phone can't do for me... I will need to pull out my iPad or laptop anyway.On the hardware side, I'd say this phone is perfect for what it was intended to be... a top-of-the-line micro Android phone. The full size Android phones are there for those that want a bigger screen. I hate phones with low battery.. C5-03 nokia i would like better. can i know x10 & x8 which 1 better ??? su bateria sera buena...y de que hablar de la resistencia a las caidas lo soportara??? i think its x10 mini standing with apple.....!!!!! is it better than x10 mini in terms battery life???? yes n97 suckx .. bad tym ..
hey i wanna know is it better than the n97 mini???? • HTC Touch - Touch Dual - Touch Cruise - HELP! 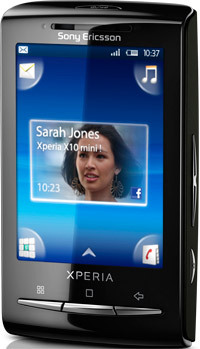 We have done our best to provide you the correct technical specifications for the Sony Ericsson Xperia X10 Mini Pro. Please let us know if you find any errors.